We provide pastoral and spiritual care for for the people who are served in our Disabilities Ministry . We serve clients, their families and friends, our staff and volunteeers, our diocesan family and the wider communtiy who seek our services. Pastoral Ministry is at the heart of DPD, an integral part of Msgr. Jack Wehrlen&apos;s legacy of love. The CARE group is an exciting, lively, and dynamic ministry of dozens of people, some with disabilities and also volunteers who convene at Saint Thomas the Apostle Church, a Catholic parish in Oak Ridge. Special Education teachers have volunteered for 26 years, designed a curriculum that includes sacred scripture lessons, music, arts and crafts and other fun activities. 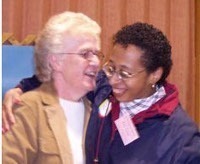 Sr. Joan Kathleen Gercke, SSJ, (pictured, right, with Pam), started C.A.R.E in 1989. Bible Study and Spiritual Life Activities specifically designed for the group home residents are regularly held in all of the DPD homes. Each idividual house has this unique opportunity to pray together and for one another. Lessons follow the liturgical year and incorporate seasonal themes always with a religious perspective.